How to decorate an MDF chest of drawers, using stencils and creative paintwork to achieve a decorative faux antique look. How to make artwork using sequins. This creates an amazing reflective eye-catching finish which we found even babies love! Learn how to make beautiful hand made roses out of clay. Followed by instructions on how to paint them for an antique look. On a trip to Spain some beautiful delicate floral earrings caught our eye. Upon inspection we saw they were made from real pressed flowers from the seller's own garden. This is our version, which we think is equally as beautiful and easy to make, too. For this beautiful old fifties mirror it was time for a makeover. The paintwork was peeling and since we actually wanted to use the mirror in the bathroom as a makeup mirror, the convex mirror wasn't suitable at all. 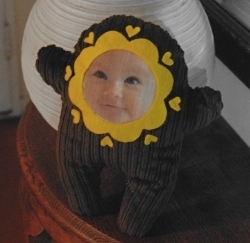 How to make a personalized soft toy with a photographic face. Download our free pattern for these cuties which we call 'Giggling Gurties'.